New York Emerges as Leader in Climate Revolution. The Time to Act is Now. If there has ever been a time to take responsibility for our planet, it’s now. After this past weekend, you’ve likely heard about Trump’s announcement to exit the Paris climate agreement – the agreement in which nearly every country in the world had joined together and pledged voluntary action on climate change. It’s clear that the White House is not interested in investing to combat CO2 emissions – the good news is, there are clear, impactful steps that we can take right now to make a difference. This is the good news – that bold climate action will continue regardless of Trumps failed policies. The responsibility of reducing greenhouse gas emissions has now shifted away from the federal government to the state and city level. And as of Friday, at least 9 governors and 125 mayors have stepped up and committed to upholding the accord’s goals. Three states in particular have come emerged as leaders in their climate action pledges – California, Washington, & our home state of New York. Governors from each of these states formed the U.S. Climate Alliance in response to Trump’s announcement last week. These three states represent approximately 68 million people — nearly one-in-five Americans. And as of Monday, the U.S. Climate Alliance has grown by 10 more members committed to upholding the Paris Accord and taking aggressive action on climate change. So, what does this actually look like for us here in New York State? We’re fortunate to live in a state where our Governor understands the importance of climate action and has a bold strategy to curb New York’s greenhouse gas emissions, while growing our clean energy economy. In a recent press release, Governor Andrew Cuomo announced a partnership with the ILR School’s Worker Institute at Cornell University and Climate Jobs NY, which focuses on accelerating energy efficiency and renewable energy growth in New York. It’s up to us to act now. It’s clear that the Federal Government is not leading this country to prosperity, security, or justice for the people or the climate. Fortunately, powering your home or business has never been easier or cheaper – with options ranging from panels on your roof, or buying panels on community solar farms, you can help reduce our CO2 footprint and combat the short-sighted actions of our White House. Let’s take advantage of this opportunity to lead the way in New York State – change starts with us. We invite you to make your own commitment to the climate and choose to power your life with solar. ​INTERESTED IN THE PROCESS OF GOING SOLAR? ​Our Solar Buyer's Guide is the perfect crash course in going solar. 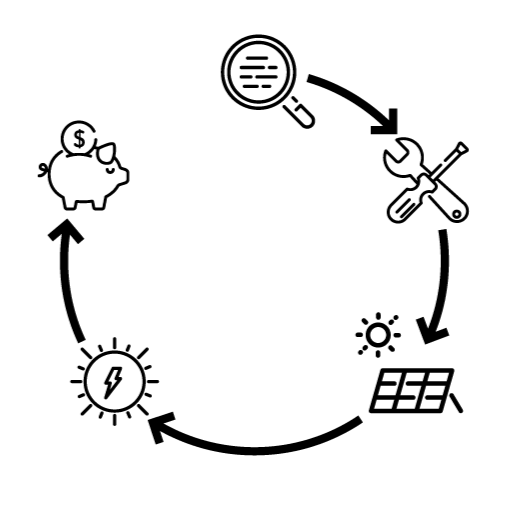 We'll help you understand the process of going solar, from A to Z. Download the free eBook today!